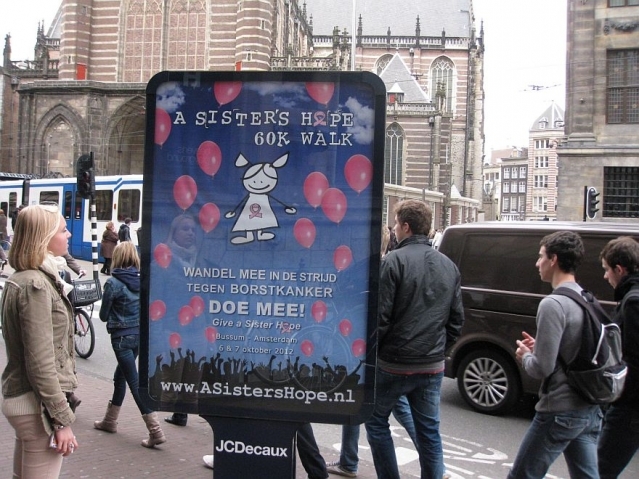 Wilt u de nieuwsbrief van A Sister's Hope in uw mail ontvangen? Klik hier! En als u de nieuwsbrief niet meer wilt ontvangen, kunt u zich hier afmelden. 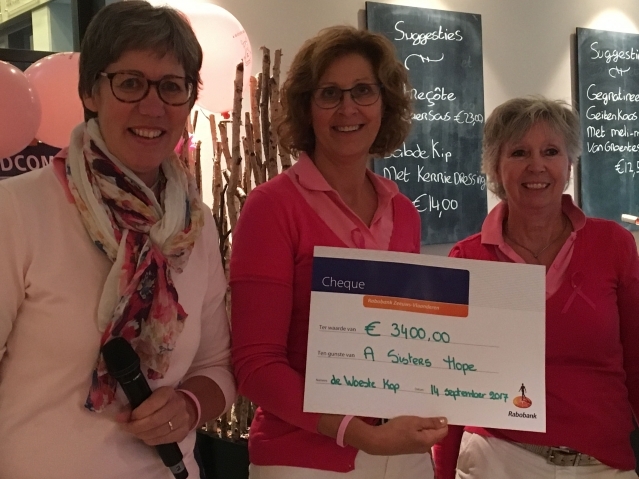 The "Take A Swing at Breast Cancer" golf tournament at Het Rijk van Nunspeet was forced to be rescheduled. Watch for a new date to be announced! Veenlanden College uit Mijdrecht: "Entrepenasium"
A Sister's Hope bedankt Luuk, Esmee, Ischa, Joep en Paris en Renee, Maud, Beau, Willem en Harold voor hun inzet en enthousiasme en hun euro's. 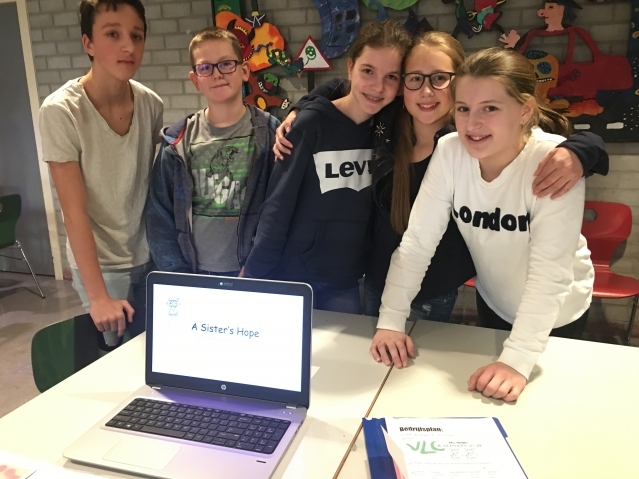 Dit zijn leerlingen van het Veenlanden College uit Mijdrecht die aan het project Entrepenasium hebben gewerkt. Samen hebben zij €217,36 gedoneerd! Around 75% of all breast cancer patients present with hormone receptor-positive disease. This implies the tumor cells are positive for a protein called the Estrogen Receptor; a hormone-binding protein in the nucleus of the tumor cell. Importantly, tumor growth is thought to be dependent on the activity the Estrogen Receptor. This renders the Estrogen Receptor a prime drug target in the treatment of breast cancer, but resistance to hormonal treatment is frequently observed. Importantly, most tumors that are resistant to hormonal treatment still remain positive for the Estrogen Receptor, and still dependent on this protein for tumor growth. Would it be possible to target the Estrogen Receptor indirectly in this setting, and with that effectively treating hormone-resistant tumors? Previously, we identified all proteins that interact with the Estrogen Receptor in breast cancer cells, and identified a previously-unknown interaction partner for the Estrogen Receptor in tumors. This protein appeared critical for Estrogen Receptor function, also in hormone-resistant conditions. With this, we are exploring the possibility of targeting Estrogen Receptor-interacting proteins rather than the receptor itself, as a novel strategy to treat hormone-resistant breast cancer. In collaboration with researchers from the USA (prof. Anton Simeonov, NIH, Bethesda), we identified a chemical inhibitor of our newly-identified Estrogen Receptor interacting protein. In cell lines, this inhibitor blocked proliferation of all Estrogen Receptor-positive cells we tested, and completely eradicated Estrogen Receptor activity. Also breast cancer cells that were resistant to all known hormonal therapies were effectively killed with this new compound. Next, we tested whether this new compound would also be successful in treating tumors in mice. Even though the compound was not toxic, well-tolerated and stable in the blood of the mouse, no major effect on tumor growth was observed. With this, we conclude that the compound would require additional optimization before further clinical testing. To determine whether drugging this specific protein would have potential in the human setting, we analysed drug efficacy on human surgical material from breast tumors, in collaboration with prof. Wayne Tilley (University of Adelaide, Australia). In this approach, surgical resection material from breast cancers is put on a small sponge and taken into culture. This way, the human tumor tissue can be kept alive for multiple days outside of the body, and exposed to different medications to determine whether the drug would be suitable to kill the tumor cells. Using this novel technology, we treated the tissue for 5 days with our inhibitor. Thereafter, we test whether the drug had an effect on the tumor cells, by looking at tumor cell proliferation. This approach was performed for 20 human breast tumors. We could show that the new compound successfully blocked tumor cell proliferation in this setting, illustrating that this approach is feasibly, and inhibition of Estrogen Receptor interacting proteins may have therapeutic potential. We identified a novel drug target in the treatment of hormone receptor-positive breast cancer, and developed a chemical inhibitor that has potential to block proliferation in hormone-resistant tumor cell lines. However, currently all experimental analyses on human tumor tissue has been limited to cultures from primary surgery. In the next year, we will further test whether our novel therapeutic strategy would be applicable for metastatic breast cancer as well. For this, we will collect tumor cells derived from malignant pleural effusions. These are tumor cells that have metastasized to the pleura surrounding the lungs. As most of the patients from whom pleural fluids are removed have developed a relapse after treatment, we will be able to assess whether our novel therapeutic approach would also be effective in this setting. With this, we aim to further improve treatment of metastatic breast cancer. Dit kon in de jaren 60 zomaar op de gevel van een kapper staan. Maar het was deze keer letterlijk watergolf tijdens de Sister's Hope-wedstrijd. Kleurde de holes vorige jaren nog mooi roze, dit jaar voerde watergrijs de boventoon en dan in meer dan 50 shades. Het viel niet met bakken maar met containers tegelijk uit de lucht. Het leek wel of het kleine zusje van de vernietigende orkaan Irma deze middag Axel even aandeed. Bijna 90 bikkels stroopten niettemin de mouwen op en gingen om 12.00 uur met een gunshot van start voor de zesde editie van deze bijzondere wedstrijd. Het was bar en boos om te spelen, maar de deelnemers lieten zich niet kennen. Soppende schoenen, kapotte plu's…wat maakte het nog uit? Her en der werd zelfs gezongen op de baan. Opnieuw werd ook royaal gegeven voor het zo nodige goede doel. De eindteller gaf € 3.400,00 aan. Een mooi bedrag dat bij elkaar werd gebracht door de extra greenfee, de verkoop van loten voor de exclusieve fles wijn en loten voor de tombola, waarmee bijzondere prijzen (grote en kleine) te winnen waren. De prijzen liepen uiteen van zakken 'patatten en juin' tot flessen wijn, tasjes, een raamreiniger, eetbonnen voor restaurants tot…. Het voert te ver om alle sponsors -bedrijven en particulieren- hier te noemen, maar wees ervan verzekerd dat wij als organisatie iedereen die in welke vorm dan ook iets heeft bijgedragen aan deze geslaagde maar doorweekte dag, heel erg dankbaar zijn. 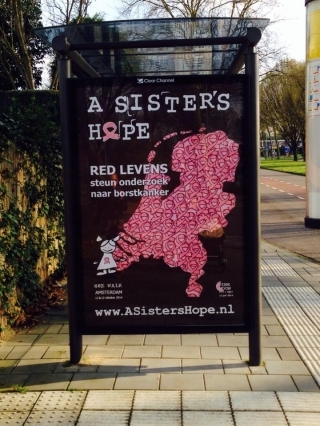 En dat is de Stichting 'A Sister's Hope' zeer zeker ook. Opnieuw hebben we met z'n allen bewezen dat we in Zeeland kunnen vechten tegen het water en dat zullen blijven doen, net zoals we zullen blijven strijden om de ziekte borstkanker te bedwingen. 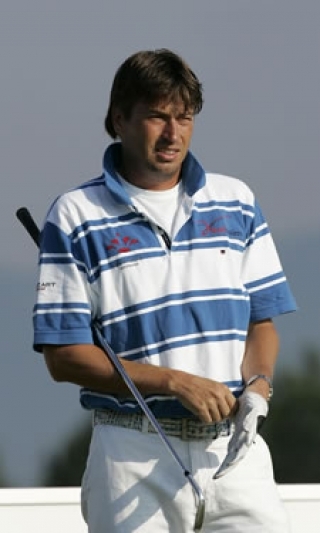 Het team van Esta en Manfred Loechter, Trees Fassaert en Anna Paris won met 44 Stableford punten de 18 holes-ronde. Bij de chipwedstrijd was het team van Marleen de Bakker, Evelien Klever, Carla Hermans en Steven Hamelink het sterkste. 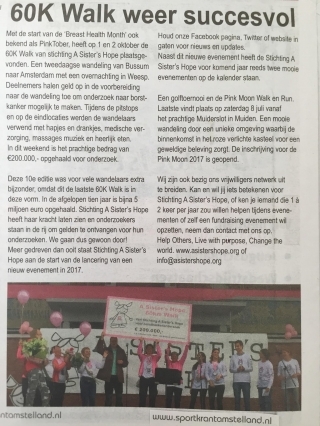 Pink Moon bij het Muiderslot = 8.000 euro voor onderzoek! Wat was het weer een feestje zaterdag 8 juli. De versnaperingen bij de pitstops en de finish. 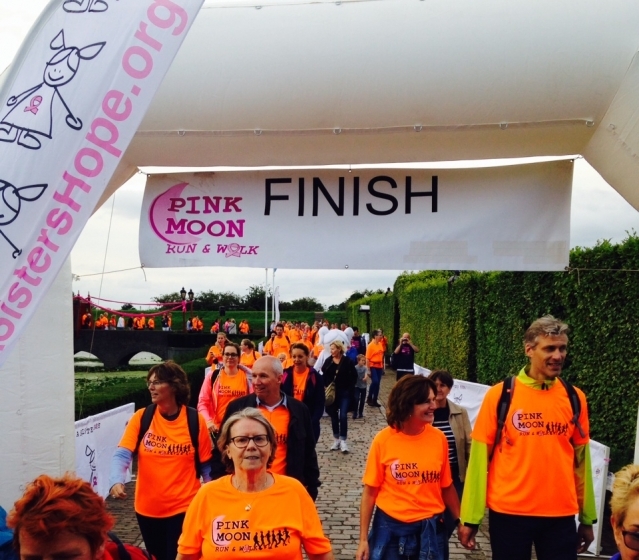 Het kasteel was weer top aangekleed, zelfs met een echte finishboog en Pink Moon Roze gekleurd. En de swingende show van 4FUN! Er is € 8.000,- opgehaald voor onderzoek! Dank je wel, EDM Tandarts! "Wauw, wat een prachtige donatie! De trotse ontvangers zijn de onderzoekers Gabe Sonke, Wilbert Zwart (midden) en Sabine Linn. Alle drie doen zij onderzoek naar borstkanker in het AVL. 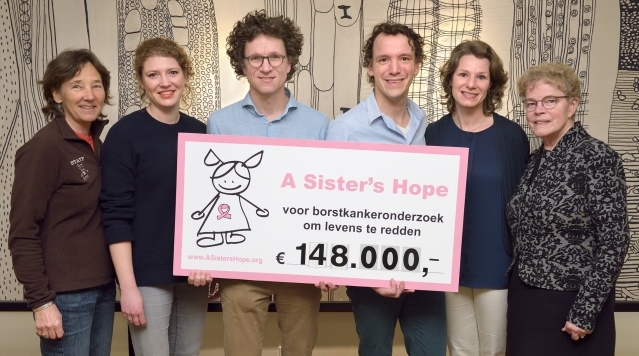 Het bedrag van € 148.000 is afkomstig van stichting A Sister's Hope; jaarlijks organiseert deze stichting evenementen ten gunste van borstkankeronderzoek. We zijn erg blij met deze donatie en willen de organisatoren en alle actievoerders van A Sister's Hope hartelijk bedanken. Hier kunnen we mooi onderzoek van doen!" 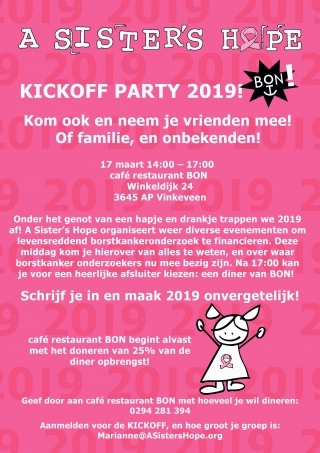 In March, the Amsterdam office held another successful bake sale raising a massive 750 Euros for A Sister's Hope, an organization Elsevier has been supporting for the last 5 years. I asked Cathy Seabaugh, Founder and Director of the charity, to tell us a little bit more. Can you give a brief introduction about A Sister's Hope and how you came to set it up? My sister was first diagnosed with breast cancer in February 1999 and I soon came to learn that funding for researchers still is limited and often difficult for them to access. 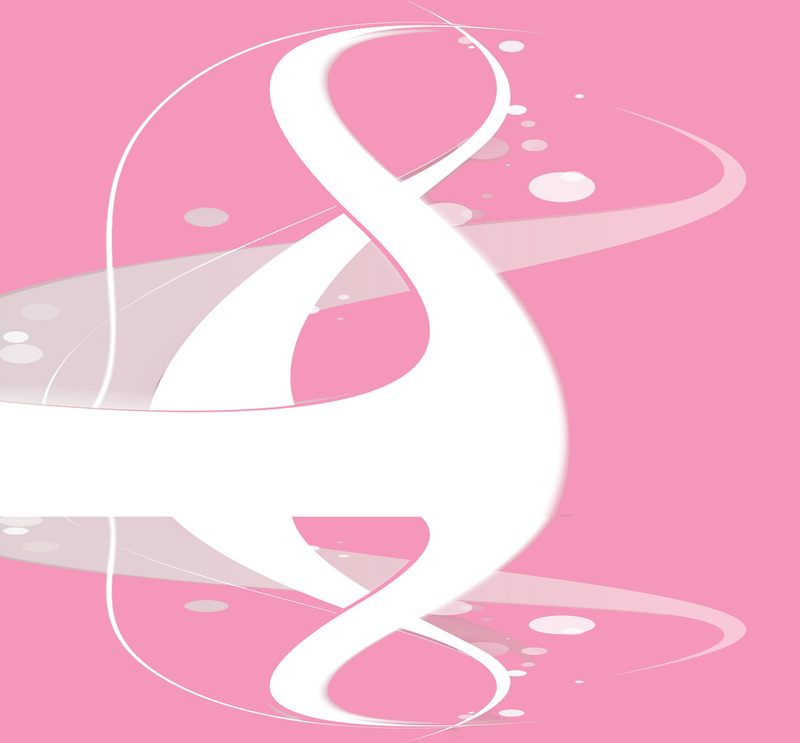 By the end of 2006, I had gotten everything in place to launch a non-profit that focused solely on funding breast cancer research aimed at saving lives. 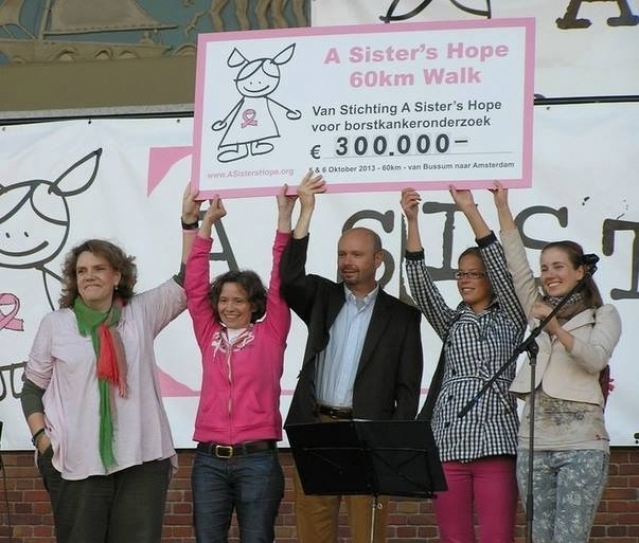 In 2007, along with Martje Hoekmeijer, a Dutch woman I had met in 2006, we founded Stichting A Sister's Hope, the Dutch version of what I started in the United States. Growth in The Netherlands took off within six months and over the past nine years we have been able to place 4.68 million euro into the laboratories of Holland's brightest breast cancer researchers. As my sister faces the disease a second time now, A Sister's Hope emphasizes the fact that "time is critical." Many charities seem to lose sight of that fact, retaining huge reserves of donations in their accounts for "the future". For whose future? 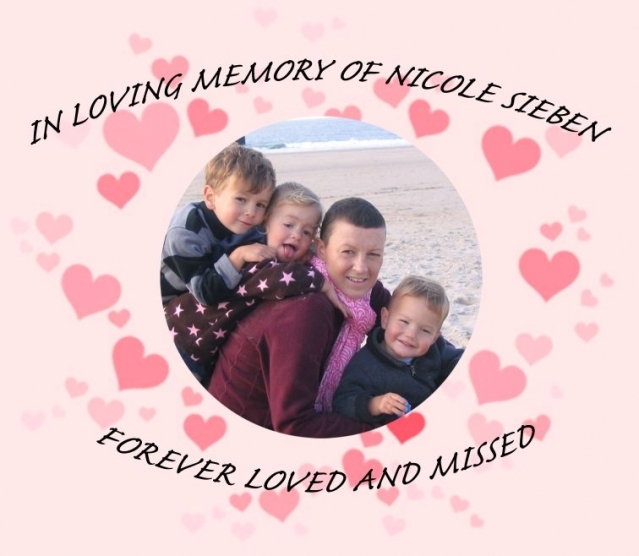 A Sister's Hope does not waste time, does not waste money, and gives funds raised directly to researchers who are working to save the lives of those we love. We keep it simple. We give a sister hope. Elsevier has raised over 16,000 Euros (fund raised and matched by Elsevier Foundation) in the last 5 years for A Sister's Hope. Where does this money go and where can we find out more information? The 16,000 euro contributed by Elsevier has gone directly toward research in The Netherlands that is focused on identifying more effective treatments and, ultimately, finding a cure for breast cancer. 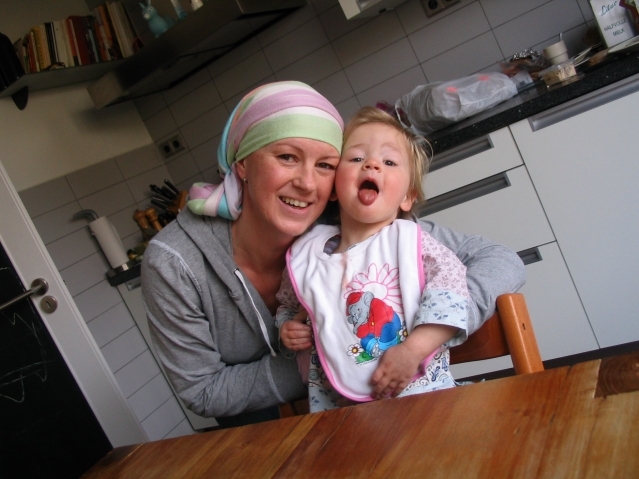 The Elsevier amount is significant, considering that the first grant ever awarded by A Sister's Hope in December 2007 was a 12,000-euro subsidy to Prof. Dr. Sabine Linn at the Netherlands Cancer Institute/Antoni van Leeuwenhoek Hospital. 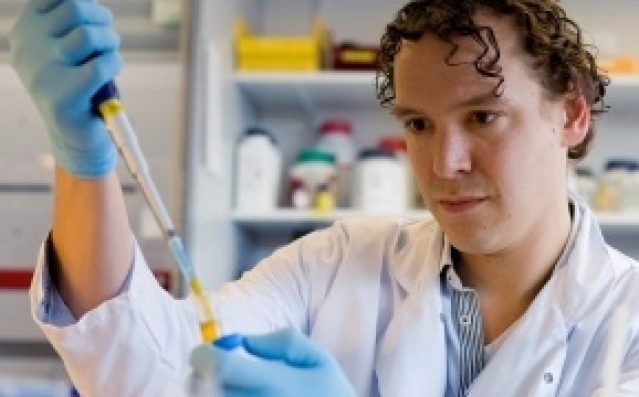 In 2015, researcher Wilbert Zwart required just 15,000 euro to carry him through 2016 and the final stage of his research project. Elsevier donations have made a tremendous impact. Antoni van Leeuwenhoek onderzoekers Elzo de Wit en Wilbert Zwart hebben allebei een prestigieuze Vidi subsidie toegekend gekregen van de NWO (Nederlandse Organisatie voor Wetenschappelijk Onderzoek). Aan de Vidi is een bedrag van 800.000 euro verbonden. Dit geld is bedoeld om talentvolle jonge onderzoekers te helpen hun eigen, vernieuwende onderzoekslijn op te zetten en hun eigen onderzoeksgroep (verder) op te bouwen. Wilbert Zwart is groepsleider bij de sectie Moleculaire Pathologie. Hij is gespecialiseerd in zowel basaal als translationeel onderzoek naar hormoongevoelige tumoren. 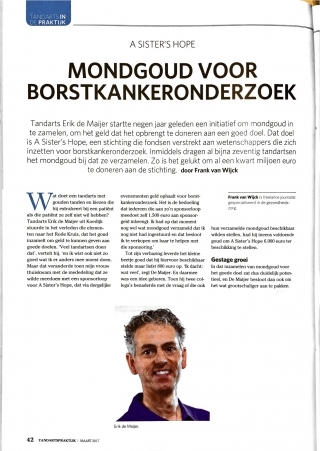 Met het geld van de Vidi zal Wilbert zijn onderzoek naar uitgezaaide borstkanker verder uitbreiden. 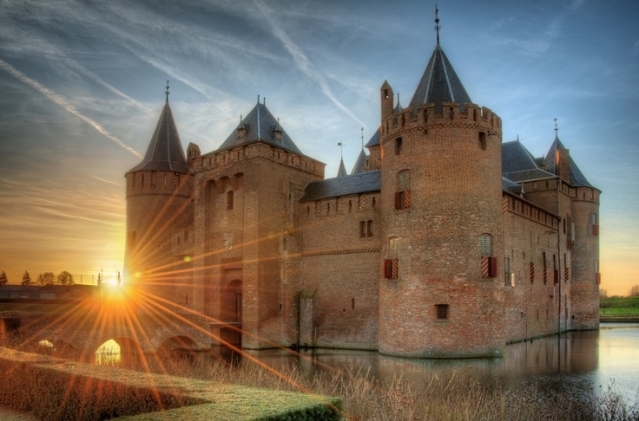 Hoe kan uitgezaaide borstkanker het beste worden bestreden? En hoe kunnen artsen in de toekomst uit deze behandelingen degene kiezen die het beste is voor een individuele patient? Dat zijn vragen waar hij straks antwoord op hoopt te kunnen geven. * Zwart has been receiving funding from A Sister's Hope for the past few years. The stichting is very proud to be an early supporter of his vital work. 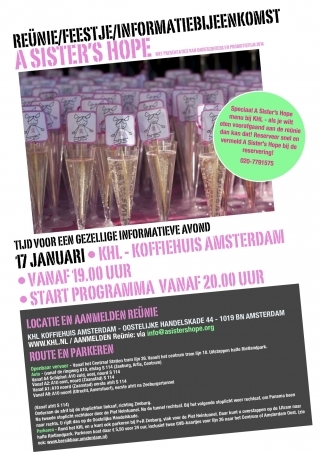 Voor meer informatie over de evenementen van Stichting A Sister's Hope kan je een van de informatie bijeenkomsten bezoeken. Stuur dan een mailtje aan Astrid@ASistersHope.org en meld je aan! Zet 31 januari snel in je agenda! Voor borstkankeronderzoek om levens te redden. Van A Sister's Hope. Dank je wel, deelnemers en sponsors! Wandel met ons mee of loop hard voor het goede doel. We gaan 40 kilometer afleggen, te voet, wandelend of hardlopend door het prachtige Nederlandse landschap. We gaan iets doen wat er toe doet, iets groots, in de strijd tegen borstkanker. In het wandelprogramma is een fout geslopen, wij organiseren geen evenement op 11 juli. 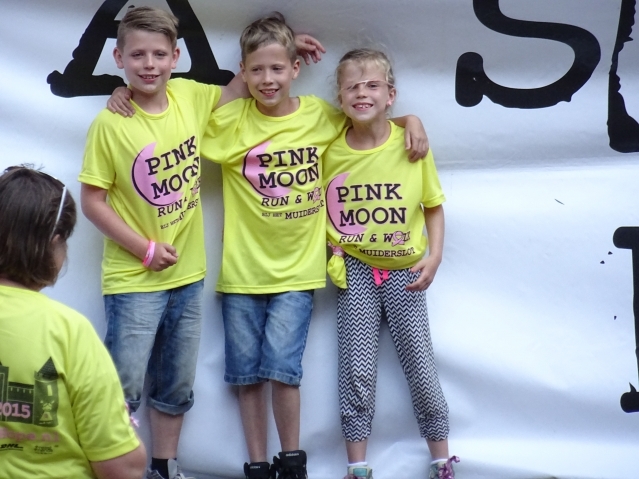 De Pink Moon Run & Walk werd gehouden op 27 juni j.l. Doe mee! Meld je aan en stuur een e-mail naar: Astrid@ASistersHope.org. Hartelijk bedankt to Mariette Steenvoorden of Bloemenhuis Lobelia for the beautiful flowers used in this year's closing ceremony of the 60K Walk, Oct. 11-12! 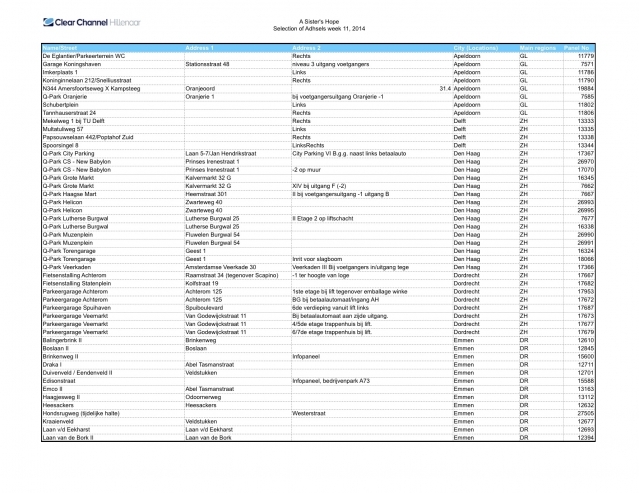 In 2012 bundelden zij de krachten om samen muziek te maken en 4FUN was geboren. Een damespopgroep met Power, Dynamiek en Stijl. Soepel en moeiteloos vertolken zij een repertoire van 70's en 80s muziek met een speciaal uitstapje naar "The Andrew Sisters". Een optreden van 4FUN is altijd goed voor een swingende avond vol energie. Can I tell her everything is going to be okay? Benefietdiner voor A Sister's Hope, Klooster Hotel Amersfoort. 5.000 euro voor het goede doel! Gatske Onsman gefeliciteerd met de goodie bag van The Body Shop. Feiko Hilhorst gefeliciteerd met 10 zwembadkaartjes. Lonneke van de Broek gefeliciteerd met 10 zwembadkaartjes. Laila de Vries gefeliciteerd met Inglot workshop + 30 euro aan producten. Harry Hilhorst gefeliciteerd met de dinerbon voor Eethuys Cafe De Generaal. Vera van Arnhem Gefeliciteerd met de hotelovernachting bij Mercure Nieuwegein. Leden van Quiltcafe Ginneken exposeren hun werk van afgelopen jaren; vele extra's zun aanwezig zoals. Kinder-knutselhoek, tombola met leuke zelfgemaakte prijzen, vlaggetjesprijsvraag, demonstraties op de borduurmachine en veel meer. Workshops met Marian Verdonk, Marjet de Pauw, Wolwinkel 'T Spinneke uit Chaam, en workshop voor kinderen op een kindernaaimachine (Godefroy). Ervaar het zelf door middel van een workshop, voor alle workshops wordt een vergoeding van 5 euro gevraagd. Toegang: 2 euro; kinderen tot 12 jaar gratis. 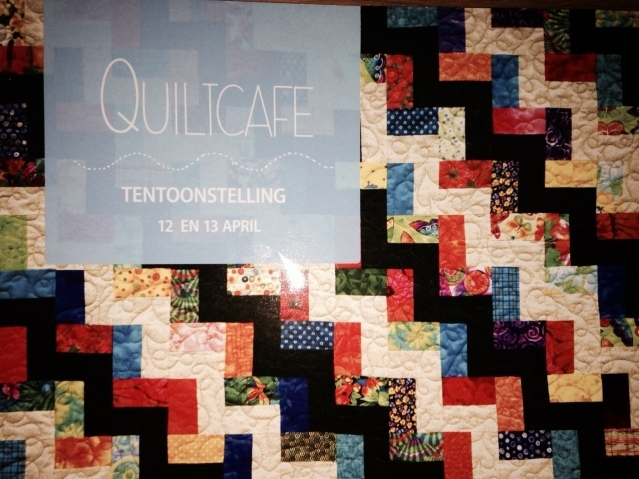 Quiltcafe Ginneken steunt met de helft van de opbrengst A Sister's Hope. Openingstijden: zaterdag 12 april van 10.00-17.00 u; zondag 13 april van 11.00-17.00 u.
Wij willen jouw foto's van A Sister's Hope abri/MUPI's! Kijk goed uit naar de bustop posters nu overal in nederland. Op 16 januari, overhandigde A Sister's Hope een cheque van 224.925 euro aan Emile Voest, directeur Zorg en Zorgontwikkeling van het Antoni van Leeuwenhoek! Dit geweldige bedrag wordt gebruikt voor projecten op het gebied van borstkanker. This year, we are going to set goals each month for walker registrations so we all can track our progress toward success for 2014! In previous years, the highest walker registration total as of Nov. 15 was 79 walkers. So the goal for Nov. 15, 2013 = 80 walkers. Walker registration total as of Oct. 29 = 40 walkers. If you know you are going to walk in 2014, please go ahead and get registered so that others visiting the website can see and feel the momentum! As International Breast Health Month comes to a close, let's vividly remember that breast cancer is not just something we think about in October. Between November 1, 2013, and October 1, 2014, we are moving toward 500 walker registrations to raise vital funds for breast cancer research to save lives. That's the only reason A Sister's Hope exists: helping researchers to save the lives of those we love. It's that simple. Please register TODAY. Let's do this! AMSTERDAM, 21 oktober 2013 — Roze, roze, roze: het Amsterdamse Hard Rock Cafe en het Max Euweplein kleuren zondag 27 oktober volledig roze. Letterlijk door de volledige uitlichting van het cafe in die kleur, en figuurlijk met het oplaten van meer dan 400 roze ballonnen met persoonlijke boodschappen. 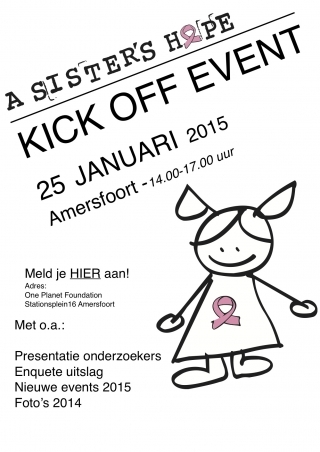 Martje Hoekmeijer, medeoprichter van A Sister's Hope in Nederland, zal om 15:00 uur de eerste ballon oplaten. Dit alles om extra bewustzijn te creeren voor de strijd tegen borstkanker, in een maand waarin door het Hard Rock Cafe geld wordt ingezameld voor het goede doel: A Sister's Hope. De gehele maand oktober, omgedoopt tot Pinktober, zet Hard Rock Cafe Amsterdam zich in voor de strijd tegen borstkanker. Met de verkoop van speciale Pinktober T-shirts, tassen, armbandjes, badjassen, sjaals, beddengoed en een unieke variant van hun beroemde 'pins' in hun aangrenzende Rock Shop wil het Hard Rock Cafe Amsterdam geld ophalen voor de Nederlandse afdeling van A Sister's Hope. Een organisatie die zich inzet voor het onderzoek naar borstkanker. Op de kaart in het restaurant staan speciale roze cocktails en cupcakes. Gasten kunnen bovendien voor twee Euro een polsbandje en voor een Euro een roze ballon, met bijbehorend kaartje voor een persoonlijk boodschap, aanschaffen. De acties komen samen op zondag 27 oktober, als het Hard Rock Cafe volledig in het roze wordt uitgelicht en de ballonnen worden opgelaten. Medeoprichter Martje Hoekmeijer van de Nederlandse tak van A Sister's Hope laat op deze speciale dag de eerste ballon op. Claire Skudder, Sales & Marketing Manager van het Hard Rock Cafe Amsterdam: "We zijn bijzonder trots dat we voor het vijfde jaar op rij de stichting A Sister's Hope kunnen steunen. In de afgelopen vier jaar hebben we meer dan 40.000 Euro ingezameld en we hopen dat we dit jaar wederom een mooi bedrag kunnen overmaken aan dit fantastische en bovenal belangrijke goede doel. 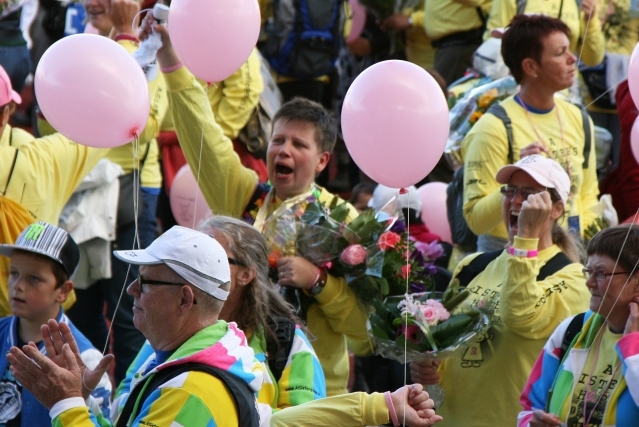 We nodigen iedereen uit om op 27 oktober om 15:00 uur met ons een roze ballon met jouw persoonlijke boodschap of wens op te laten. Of op een van de andere pinktober-dagen een uniek pinktober item aan te schaffen. De maand oktober staat sinds jaar en dag in het teken van de strijd tegen en bewustzijn creeren over borstkanker. 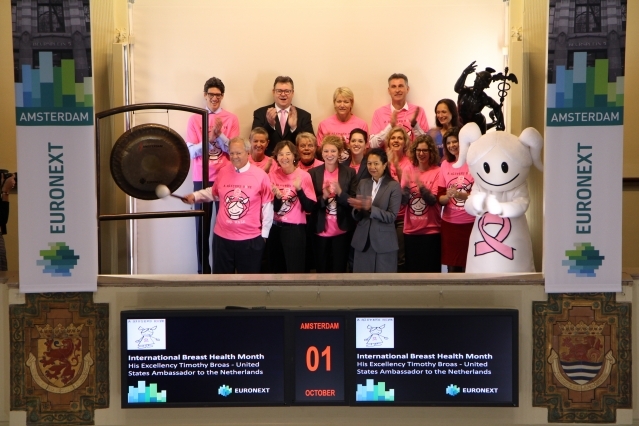 Hard Rock Cafe introduceerde veertien jaar geleden de term Pinktober en sindsdien kleurt de oktobermaand in steeds meer landen wereldwijd roze. Alle deelnemers ontzettend bedankt! Een heerlijk weekend met prachtige mensen en een fantastisch resultaat! "Het was helemaal geweldig, goed georganiseerd. Trots en blij dat ik er weer bij was. Dat ik er nog ben!" "Wat een jaar, wat een wandeling, wat een geld en wat een mooie onderzoeken kunnen hiermee gedaan worden! Aan alle wandelaars en alle andere mensen die dit tot n mooi einde hebben gebracht BEDANKT! Het was wederom een TOP jaar." Registreer je nu voor 60K 2014! 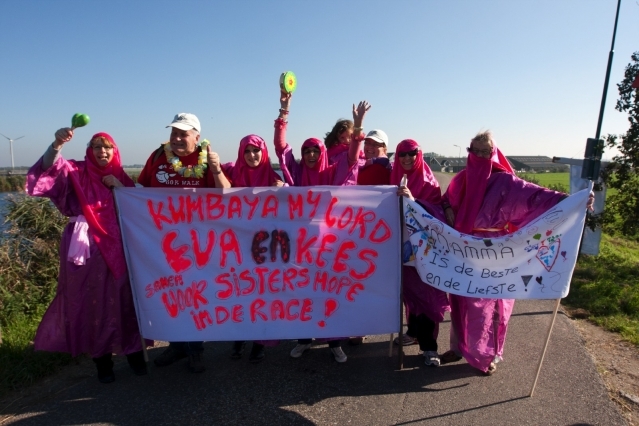 De Cheering Points zijn veilige openbare plekken langs de route en worden niet bemand door de A Sister's Hope organisatie! 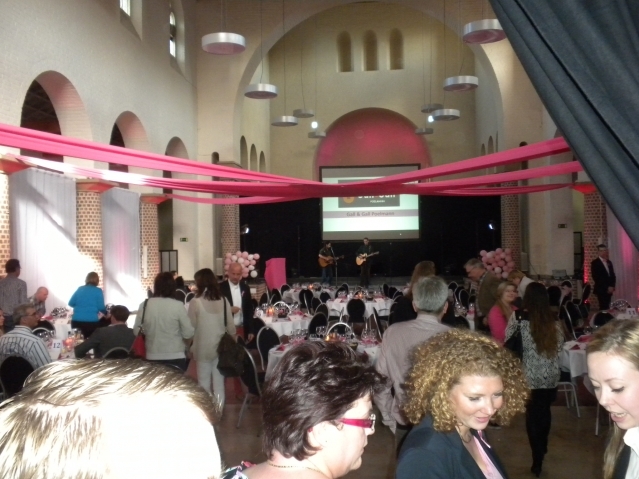 Op donderdag 19 september 2013 wordt het eerste A Sister's Hope Congres georganiseerd. 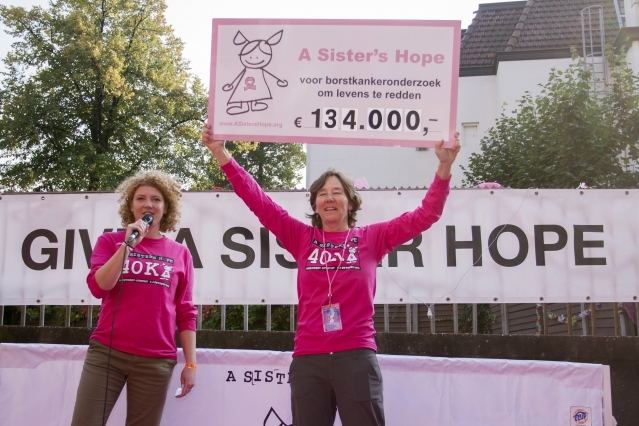 Onderzoekers die door A Sister's Hope werden en worden ondersteund in de afgelopen 6 jaar presenteren hier hun onderzoeken, zij delen hun kennis over de laatste inzichten in hun onderzoek en ontwikkelingen op het gebied van borstkankeronderzoek in Nederland. Voor een onderzoek naar de invloed van het hebben van een chronische aandoening op het dagelijks leven en in het bijzonder de rol van bewegen en sport daarin, zijn we op zoek naar mensen die borstkanker hebben (gehad) en een vragenlijst willen invullen. Het invullen van de (online) vragenlijst duurt ongeveer 10-15 minuten en de antwoorden blijven strikt vertrouwelijk. De vragenlijst is zowel bedoeld voor mensen die veel bewegen en/of sporten als voor mensen die dit niet of nauwelijks (meer) doen. We zijn benieuwd naar uw verhaal! Dit onderzoek wordt uitgevoerd door het Mulier Instituut en het VU Medisch Centrum met subsidie van NWO. De resultaten zullen onder meer bekend worden gemaakt via de website van de Borstkankervereniging Nederland, A Sister's Hope en het Mulier Instituut. Zeer verslagen en verdrietig zijn wij door het bericht dat ons bereikte van het onverwachte overlijden van Liesbeth de Langen. Liesbeth is 67 jaar geworden. Liesbeth wandelde elk jaar met ons mee vanaf 2008. Zij overwon borstkanker, maar kreeg drie keer achter elkaar leukemie terug. Ze vocht hard en kwam er elke keer bovenop. Helaas heeft ze de laatste keer de strijd niet mogen winnen. Onze gedachten gaan uit naar haar familie en vrienden, die haar zullen moeten missen, terwijl zij nog zoveel toekomstdromen had. Wij wensen hen veel sterkte dit verlies te kunnen dragen. 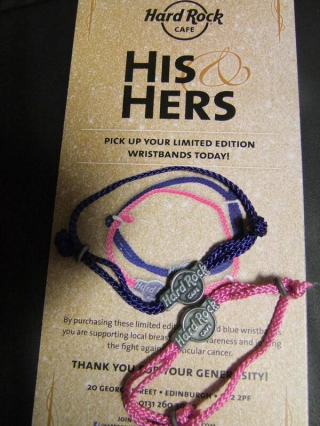 Hard Rock Cafe is working hard this summer to sell bracelets and support testicular cancer and breast cancer with their His n Hers campaign. It is a terrific time to visit the restaurant at Max Euweplein in Amsterdam! 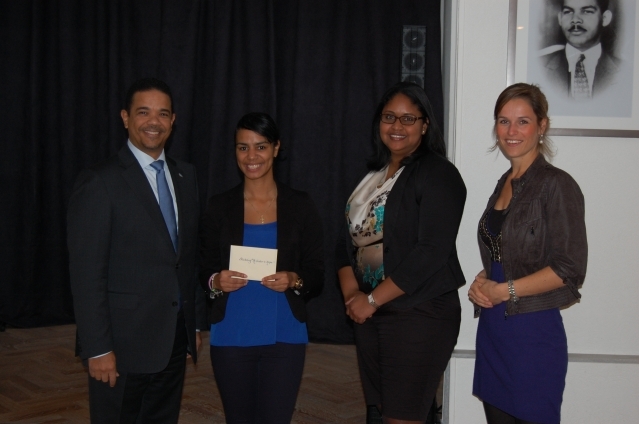 Alexmarie Alberto, staande naast Minister Plenipotenciario sr. Edwin Abath, Kabinet van de Gevolmachtigde Minister van Aruba, organiseerde medio oktober een evenement ten bate van A Sister's Hope. Haar acties, samen met vrienden Julisa Dabian, Susan Bailey en Jamilla Abdulle uitgevoerd, bleven niet onopgemerkt voor de regering van Aruba. Het ministerie deed een extra bijdrage bovenop de fondsen die Alberto en haar vrienden al hadden geworven en hield hiertoe een speciale ceremonie op 12 november. Onderzoeker Ellen Hoekman (uiterst rechts), van het Leids Universitair Medisch centrum, die samenwerkt met Dr. Carina Hilders, woonde de ceremonie ook bij om uitleg te kunnen geven over het onderzoeksproject dat door A Sister's Hope gefinancierd is. Alberto, een rechtenstudent aan de universiteit van Leiden, is op dit moment alweer vrijwilliger voor een ander project voor A Sister's Hope dat medio december zal plaatsvinden! Veel dank gaat uit naar Alexmarie, Julisa, Susan, Jamilla en het Bureau van de Minister van Aruba. 2012 Olympische gouden medaille winnaars hockey, Maartje Paumen en Carlien Dirkse van den Heuvel staan samen met A Sister's Hope op 1 oktober de gong bij de opening van NYSE Euronext Amsterdam om de Internationale Borstkankermaand in te luiden. A Sister's Hope is de eerste liefdadigheidsinstelling ooit om gekoppeld te worden aan een wereldkampioenschapstoernooi van de FIBA (Federation of International Basketball Associations). 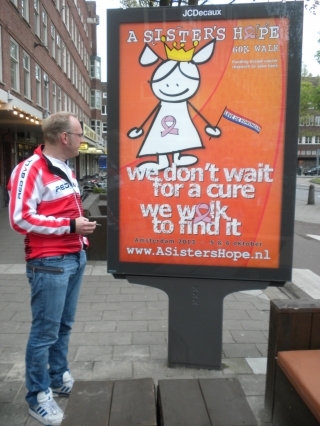 Dit jaar is Nederland het gastland voor het toernooi dat in sporthallen Zuid in Amsterdam gehouden wordt en 19 augustus was de officiele "A Sister's Hope Day". Ambassadrice Olga Commandeur was er om het publiek en spelers een warming-up te geven, en een stille veiling met verscheidene interessante stukken brachten een mooi bedrag op voor onderzoek! 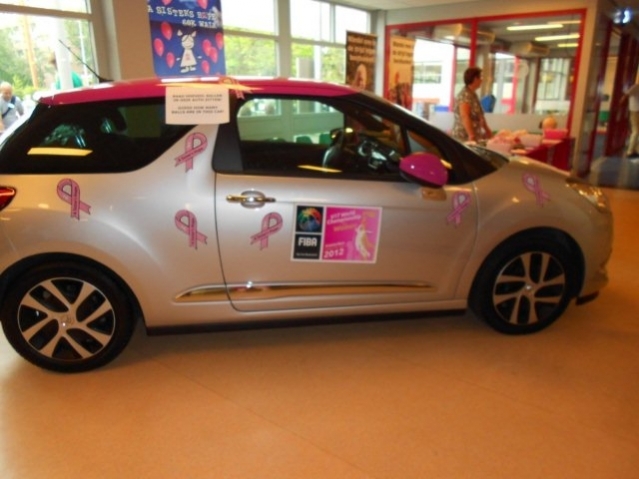 Tijdens het toernooi staat er een Citroen DS3 gevuld met ballen en bezoekers mogen raden hoeveel ballen er zich in de auto bevinden; de winnaar mag een week lang gratis in de Citroen rijden, inclusief brandstof. Abri's in Amsterdam gedurende Koninginnedag! Samen kunnen we iets moois bereiken! 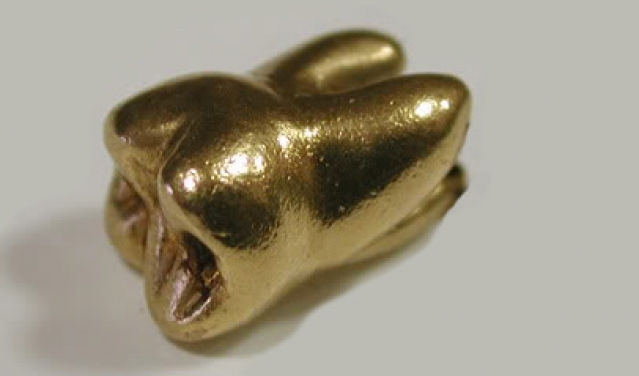 In 2009 heb ik het idee opgevat oud tandengoud te verzamelen om zo geld in te kunnen zamelen voor borstkankeronderzoek. totaal al meer dan 50.000 euro in de afgelopen 3 jaar. bekend en in Noord-Holland al redelijk bekend. daarmee kunnen we samen ons voordeel doen. deel te nemen aan het tandengoud spaarprogramma. ons een kijkje in de toekomst! Doe mee! Steun borstkankeronderzoek om levens te redden.